Wowsers! Time flies when you’re having fun 🙂 I can’t believe it’s time for our August Monthly DIY Challenge already! This month the theme is fabric! 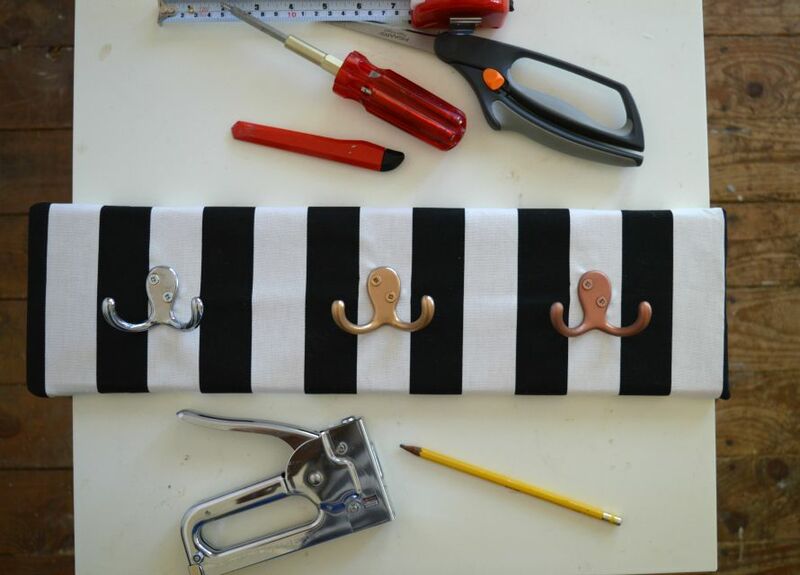 Here are the supplies I used to create Fabric Covered Front Door Hooks! 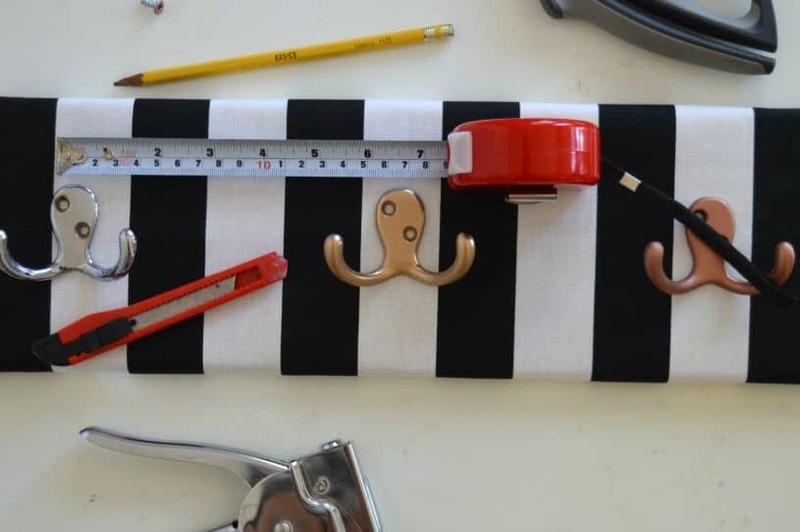 I started out with a swatch of fabric about 22″ squared, a piece of basic 6″ wood from the lumber yard, measuring tape, pencil and some mismatched hooks I had in my tool box. I measured my wood plank and cut it down to 20″ long. I knew that would be the right length to fit on the wall behind our front door. From there, I measured my fabric to be 10″ wide by about 22″ long. 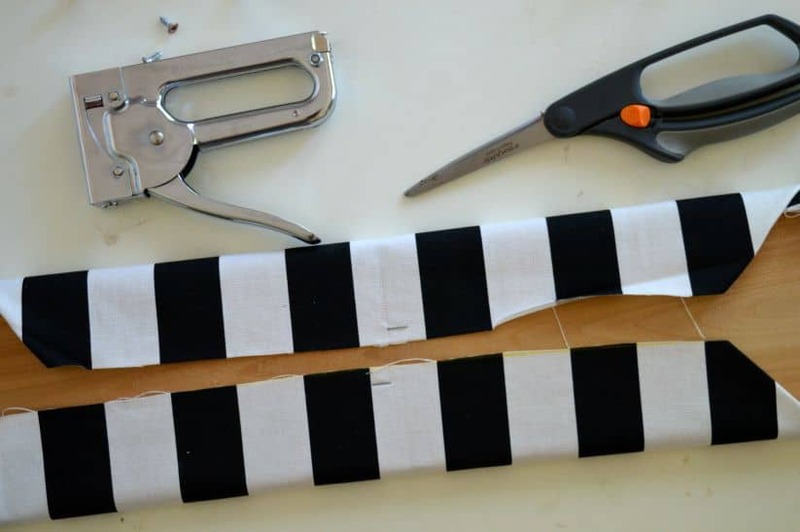 Using my staple gun, I affixed the ends of the fabric to the board and then pleated the other sides and folded them in as well. I didn’t staple everywhere. I wanted it to fit loosely at first. I decided to go for a bit of a mismatched metallic look. 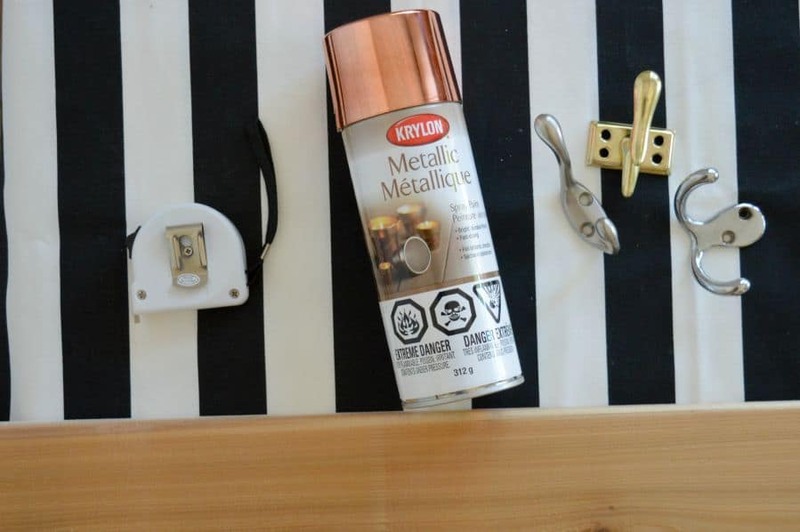 So I used a couple cans of Krylon Metallic paint to cover my ‘octopus’ hooks – one in copper and one in gold. I also sprayed the heads of some wood screws to match. I laid my hooks out on my fabric covered plank and marked where the screw holes would be. Then with a small utility knife I made slits in my fabric to ensure the screws wouldn’t make the fabric pucker when they were tightened. The finishing touch was to add some brass upholstery nails to the ends of the board to keep it consistent and then affix some heavy-duty D-ring hangers to the back so it’s strong enough to hold coats and jackets. Woop! There it is! Awwww Yeah. Do you like my new beach bag? It’s from Joe Fresh. Love that guy. The scarf is from Stella & Dot. This post contains affiliate links for your convenience. See our full privacy and disclosure policy here. The Cutest EVER Thrifted Bookshelf Rescue That Anyone Can Do! What you can get for $50 at the thrift store | National Thrift Store Day Link Up! So cute! And functional! I love the stripes and the mix of metals. Awesome take! VERY cute, guys! That was really smart to slit the fabric to avoid puckering. I’m not sure I would have thought of that. Looking forward to seeing the hallway reveal! 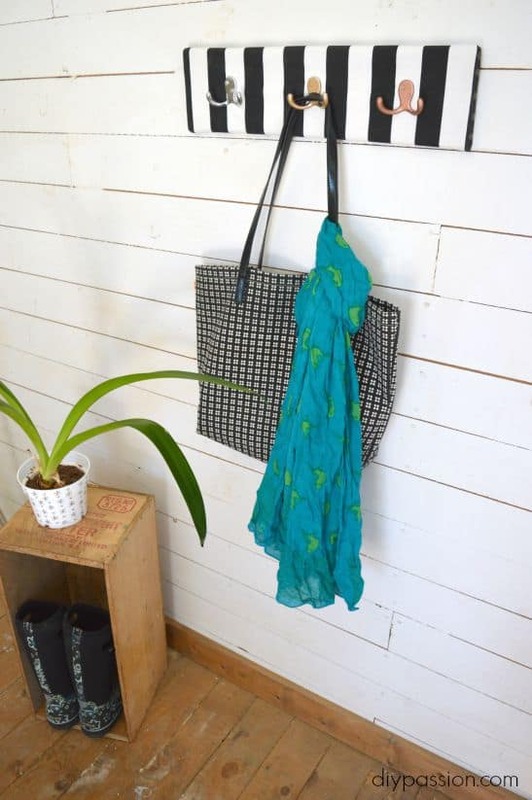 An easy way to add some pattern and colour to an otherwise utilitarian piece – lovely! Well isn’t that just the cutest?? 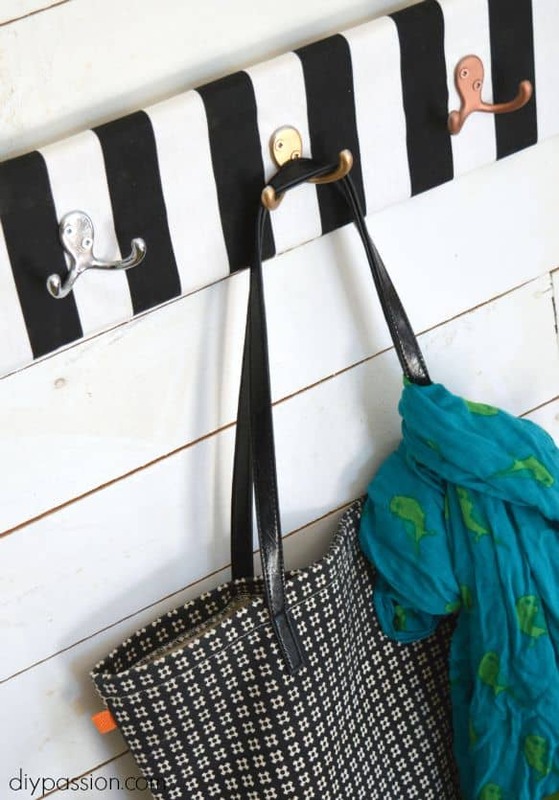 I love stripes and I really like how you used different hooks for that little touch of whimsy – beautiful!! Very cute! I would have never thought to upholster something like that, great thinking outside the box! Beautiful job, you guys! Would’ve never thought to upholster that! Love the fabric! So pretty! I love that you made all the hooks a different color. Can’t wait to see your foyer! Love it! You can never go wrong with black and white stripes 🙂 I also love how you spray painted each hook a different metallic! So fun 🙂 I’m already in love with the yellow stripes in your entryway, can’t wait to see how these hooks play in! Oh, this is so cute, Erin! The stripes perfectly classic and the mixed metal is such a fun twist! I love this! The black and white is great, but I especially love the different color hooks! Beautiful. Found over at The Creative Circle link party. Love this!! Thanks for sharing at our Living With Style Linky Party. Be sure to come back next week!! 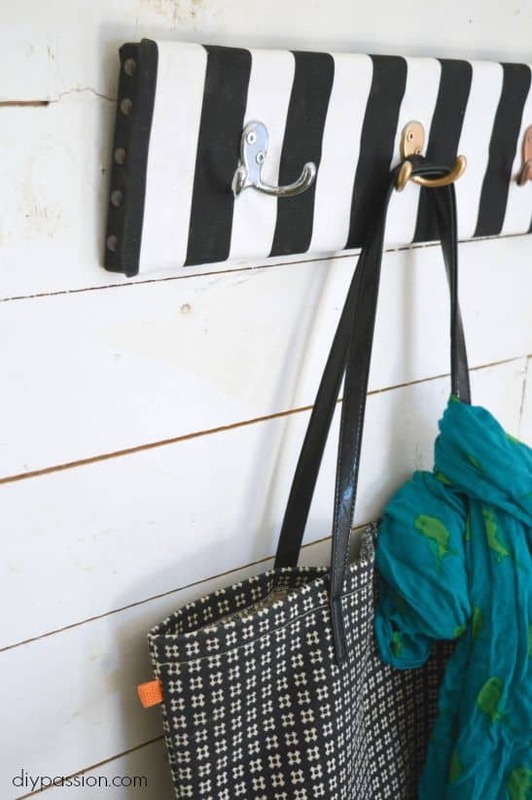 The hooks look fab – Thanks for linking up to Pin Worthy Wednesday, I have pinned your post to the Pin Worthy Wednesday Pinterest Board.